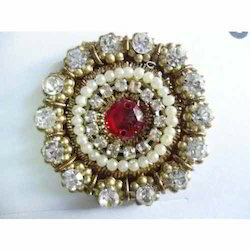 Prominent & Leading Manufacturer from Surat, we offer decorative motifs, handmade wooden tray set, hand embroidered designer motif, fancy diamond te motif, fancy motifs and hand embroidered zardosi diamond motif. 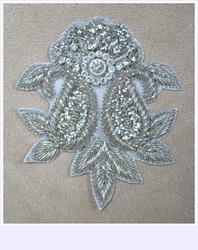 The appliques and motifs are used on all types of garments, be it on dresses, tops, pants, skirts or any other garment. 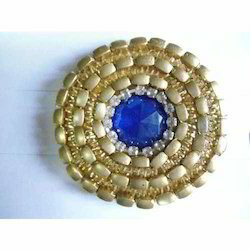 Our bead motif designs are made keeping in mind their placements on the garment, lingerie, home furnishing item or any other product of decorative art. The development of embroidered patch-work is done based on the forthcoming trends after doing considerable research using the digital and print media. The inputs & references from clients for creating embroidered motifs of their liking are of immense value in understanding the look they want. We hold expertise in manufacturing and supplying of beautifully designed Wooden Tray Sets, which are provided with an various shapes. 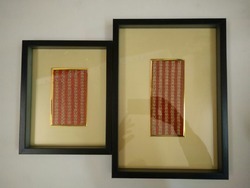 These products are designed by our creative designers and other experts using high grade raw materials. Designer Patches: We are the leading manufacturers of patches-with canvas based using best quality of diamonds,pearls and high end row materials. It is available in all size and shape. And can be personalize too. 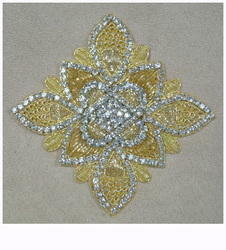 Used for designing all handwork related dresses, sarees, lehngas and all bridal wear accessories. We are a company which is engaged in the manufacture of a wide range of products such as laces, motifs which have an attractive look and are available in a range of colours. The Fancy Motifs we offer to the customers have been priced at very reasonable rates in the market and these products have been made using the best technology available in the market. These products offer a high performance to the customers and they offer a appealing look to the clothes.